It is believed that the Mullewa Motorcycle Club promoted motor cycle racing in the district, that was known as speedway racing, this form of racing may have continued through until 1933. At this point in time the location of the track or tracks are unknown. In the early 1980's possibly as early as 1981, a local speedway racer in Graeme Brittain laid out the track, He had been racing his Valiant at Geraldton for a while, The Mullewa Shire allocated some land, he went out and tore around in an oval shape, then the shire grader followed his tracks to make the track. 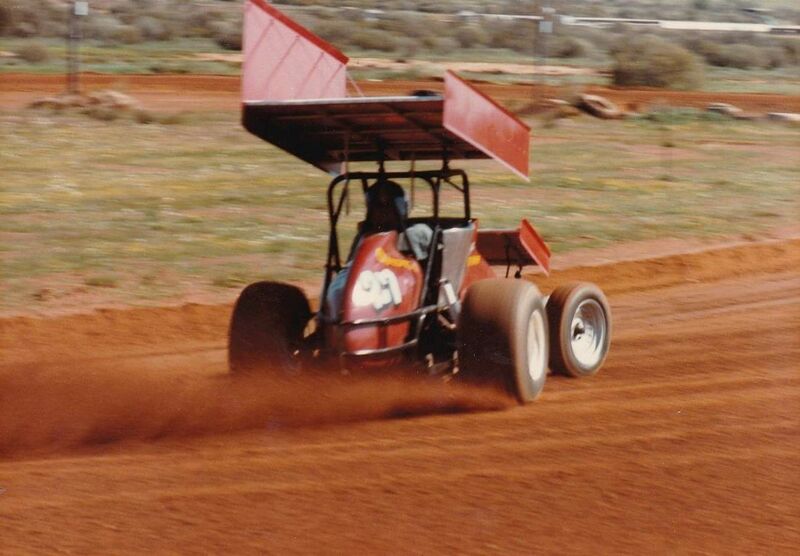 1984 Peter Newman was a Geraldton driver who often competed at the Mullewa Speedway. Photo: Peter Newman. Keith Cooper recalls: While I was living and working in the Mullewa district I just so happened to own and race a fairly average EH Holden, the driving suit of the day was a pair of CHH overhauls, the cars were raced and raced and raced some more and then on sold to the next racer that hit town, thats what happened, to mine I sold the EH for a block of Mid-strength beer, and low and behold the new owner wrote the car off in the next meeting feature.